From small business accounting & accounting software, to major corporate and farming transactions, we have you covered. ​When evaluating accounting firms you need to find the right match for you. A good information system is the key to a successful business, up-to-date reliable financial information supports proactive planning both for business development and tax compliance. Whatever your accounting needs we can assist you to keep on track and provide you with tailored information to suit your business requirements. See for yourself why we are the best accounting firm in Hawke's Bay. We are here to assist you to make the right business decisions in today’s highly competitive environment. Effective structuring and planning of your business is vital to the success of your business. Your accounting information and financial reports are one thing, but utilizing that information effectively is what gives your business the edge. We also have a close working relationship with Plan A Consulting, a local business consulting company that are having great results with clients. Follow this link www.planaconsulting.co.nz to find out more about the services they offer or ask one of the team at Black & White. We are experts in both large and small business accounting. The sale or purchase of a business is one of the most important decisions you will make in your lifetime. Our accountants are here to assist you with this process, whether that be grooming your business for sale, undertaking due diligence on a potential purchase or providing advice on appropriate and effective ownership structures. Financial due diligence is a complex process, the team at Black & White know the right questions to ask. Our accountants are here to objectively assess the financial performance of a business and ensure enough detail is obtained to provide assurance that the results are not inflated and are sustainable. We provide a comprehensive financial due diligence report which includes analysis on the financial performance, position and internal systems of the business you are looking to acquire. You reap what you sow! This is true in all industries but if there is any industry that requires the right advice and planning it’s farming. We understand the volatility of the industry and the range of issues that impact on a farming business. Our accountants can assist you to understand the financial ramifications of the multitude of decisions that need to be made. The Financial Advisers Act comes into full force on 1 July 2011. Under this legislation accountants/tax agents are prohibited from giving financial advice unless providing this service in the ordinary course of business as an accountant/tax agent. Black & White Accounting Ltd is not in the business of giving financial advice and any comment made by us on the subject of investment is not to be interpreted as advice. We recommend you seek financial advice required from a suitably qualified Financial Advisor. We work for you – not the bank. We are here to help you find the right finance for your business and ensure your lending is structured effectively. Our accountants will assist you with the preparation of detailed business plans and recommend the best financing options available to you. Effective management systems are the key to achieving efficiency within your business. Our aim is to ensure that your business achieves the potential that it is capable of. Our accountants can provide you with the regular management reports that enable you to run your business more effectively. We can identify key performance indicators in your business, which you can then monitor to enact the changes required to ensure the success of your business. Choosing the right accounting software for your business can be a difficult process – let us help you make the right choice. There are numerous products available across the spectrum of cashbooks, point of sale systems and payroll packages. The right system will assist you with the effective day-to-day management of your business. The key to a successful business is planning - defining a vision, mission and goals is essential. We’ll guide you through the process of developing a strategic plan that looks at where you want your business to be in 1, 5 and 10 years time. This plan will define exactly how you and your team can achieve your goals and objectives as well as evaluate your progress and performance. The way you structure your business now makes a huge difference to how it can operate without you in it. All successful business owners need to have a plan in place for their own eventual departure from that business. We are here to co-ordinate the transition of your business to your successors so you can get on with enjoying your retirement or whatever new endevours you choose to undertake. Taxes are a significant cost and it is important that they are managed efficiently, just like any other business expense. Effective planning is the key to managing your taxes, Black & White Accounting can take care of every aspect of your tax. We will work in partnership with you to minimize your tax and help you achieve your key objectives. At Black & White Accounting we work with you and your lawyer to prepare structured documentation to ensure your hard earned assets will be dealt with in the manner you choose. This gives you peace of mind, and gives your family the benefit of having a plan that will take care of their needs and distribute the funds in accordance with your wishes. An independent valuation provides you with answers to the questions you often need answered about the value of a business. Whether buying or selling establishing the value of a business is critical to the negotiation process. We are trained and experienced in business valuations and can provide you with guidelines and formulae for evaluating the worth of your business. 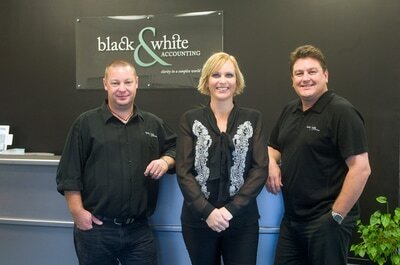 Since the inception of our business we have been working closely with Kirsten and the team at Black & White Accounting. Its so refreshing to be able to talk candidly about our business and what we are trying to achieve with Kirsten who shows an immense amount of knowledge, professionalism and is at all times attentive to our needs. Kirsten is always speedy with her responses to our queries with her wonderful advice, suggestions and guidance – a rare trait in professional practices these days! We would certainly recommend Kirsten and her team to any business out there requiring proficient, accurate, sound advice as well as providing the highest level of customer service. Thanks guys.